The language of grays is classy, timeless, moody, artistic and captivating. Black and white pictures draw a lot of viewers’ interest, attention and reaction. Color photographs tend to be boring at times because they are the same what our eyes see day and night. Unlike color photographs, black and white photographs speak a different language – they portray the same information in a different style and draw our eyes to elements and traits that our eyes don’t generally notice. They take out the dimension of color and showcase light, tones, texture, mood and time in a prominent manner. Of all these traits, the lack of color and the timelessness in black and white photographs capture the interest of even the ignoramus. Let’s delve into the colorless world in this part-I of a two part article. This can be difficult for some. Especially if you are starting out. Black and white may just not appeal to you or you may like color better. Also visualizing in black and white is challenging and comes with experience. With digital capture it’s a matter of seeing the final results instantly. However there is greater difference between the reality and the results when shooting film. However this assessment need not be left to the camera. It is important to know what you want in the final result and what you are going for. Choose your location and subject accordingly. In black and white there’s no color to mark and differentiate between different areas in the image. Also two contrasting colors will result in the same gray level in the final print. It is thus important to start seeing in terms of luminance (brightness or lightness) or various colors and areas in the image instead of chroma or color. So if I may, let me mention the RGB and HSL color-spaces here. All image information can be represented in either of these color-spaces however there’s a considerable difference the way these color-spaces represent information. In the RGB color-space all image information is represented in terms of the red, green and blue colors. All other colors are a combination of two or more of these three basic components. In a gray (black and white) image all these three components are equal. Thus RGB is not very helpful if we try to draw analogy with respect to black and white images. HSL is another color-space which represents image-information in terms of hue (the color), saturation (the amount of color) and luminance (the brightness). When it comes to black and white, only the luminance component matters in the HSL color-space. We thus need to visualize in terms of lightness or brightness of the color instead of the color itself. Once you are ready to look beyond colors you will be able to appreciate subtler qualities like geometry, shapes, textures, tones and the mood. It is these qualities that build the interest in the picture and convey a message. Thus it is important to have a firm understanding of the basics like composition, exposure etc. With digital capture there are more technicalities to consider than while shooting film. One important decision to make is whether you want to shoot black and white or whether you want to shoot in color and do the conversion as a part of post processing. Manual conversion during post processing can be and overhead but allows great flexibility in differentiating and manipulating tones based of color. Whereas levels are pretty much all that you can play around while post-processing black and whites. 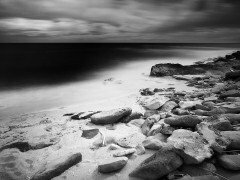 Filters add another aspect to black and white photography. The principle behind the use of color filters is simple – a filter allows a certain color to pass through while blocking others totally or partially. Thus as an example a yellow filter will block a lot of the color of sky thereby darkening the sky in the final result. It will also enhance the yellow areas in the picture whereby brightening them up into almost white. That’s quite as simple as it gets. A judicious use of correct filters can aid you in differentiating different tones based on the real colors in the original scene or subject. It is also important to decide on the image format which you want to shoot in. Black and white images put a photographer’s skills to test. Black and white images are classy and are appreciated as art masterpieces by the connoisseurs. It is thus important to understand the basics and essentials. As we shall see in the second part, it is of prime importance that we look beyond colors and expand upon the photography basics to communicate in the language of texture, shapes, composition, tones and moods. Also we will briefly touch upon conversion to grayscale as a part of post-processing the digitals in the second and final episode.